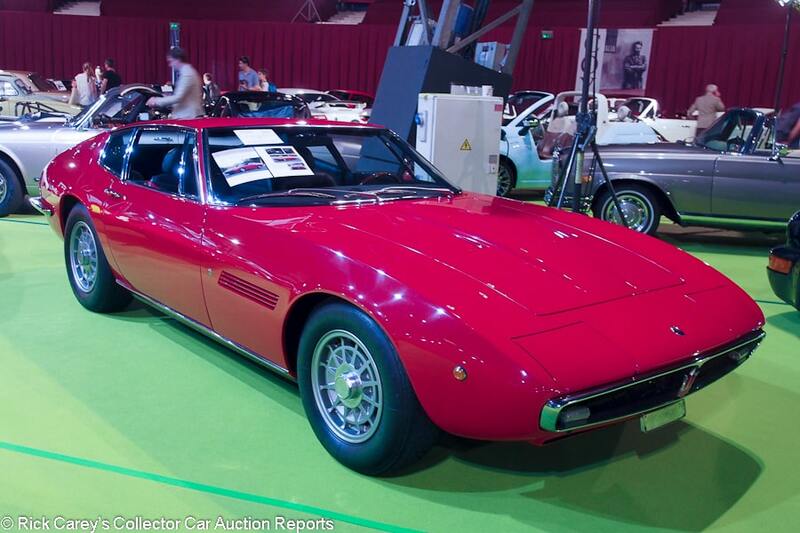 This is a rather useless auction report, and a wasted half-day on a tightly-scheduled trip to Monaco during the GP Historique. The pointlessness is on account of Coys of Kensington’s nearly opaque operation. The most recent results list promulgated by Coys on its website is from the September 7, 2017 auction at Fontwell House, eight months and many “auctions” ago. 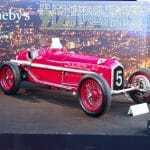 One of the headline cars, the Sauber-Mercedes C9, was a headline car at Fontwell House and is represented as sold there, yet its history in the Monaco catalog is the same as it was eight months ago including present ownership beyond eight months. 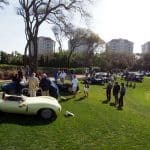 The location at Espace Fontvieille (a defunct circus venue) is dingy and threadbare as well as being at the end of the earth – in Monte Carlo terms – a sad contrast to the glitz of Monaco, the fresh, airy spaces of RM Sotheby’s Grimaldi Forum location and the elegance of Bonhams at Villa La Vigie. 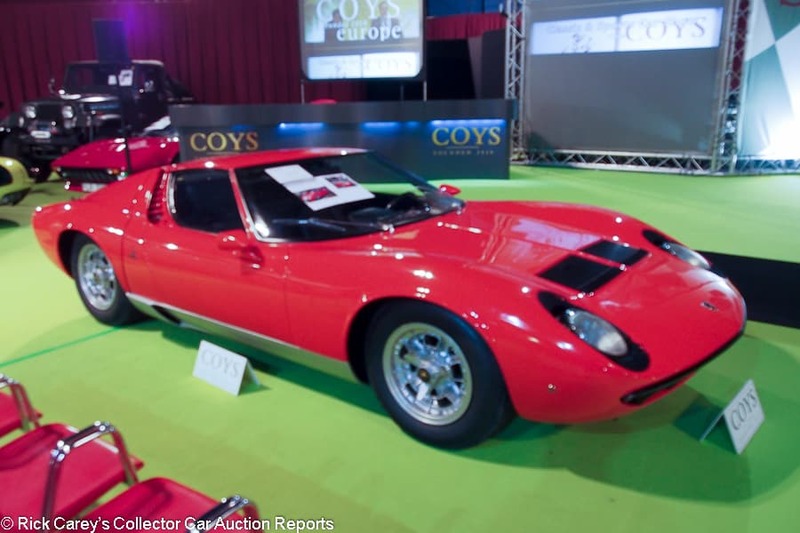 Coys Legende et Passion Monaco auction appears to be less of an auction than it does of being a travelling circus [sic] devoted to finding prospects and hand-selling inventory. 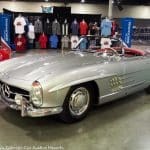 And that is unfortunate because among the cars present were a number of good, solid, intriguing examples that deserved more than such second-class treatment and presentation. 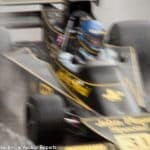 What follows are descriptions of 19 of the 100 or so cars on offer. An accurate total is impossible in the absence of an up-to-date reconciliation of the catalog and late entries. And, of course, there are no transaction results to give relevance to the descriptions. Visiting Coys Legende et Passion Monaco was total waste of half a day but for some intriguing descriptions and photos. 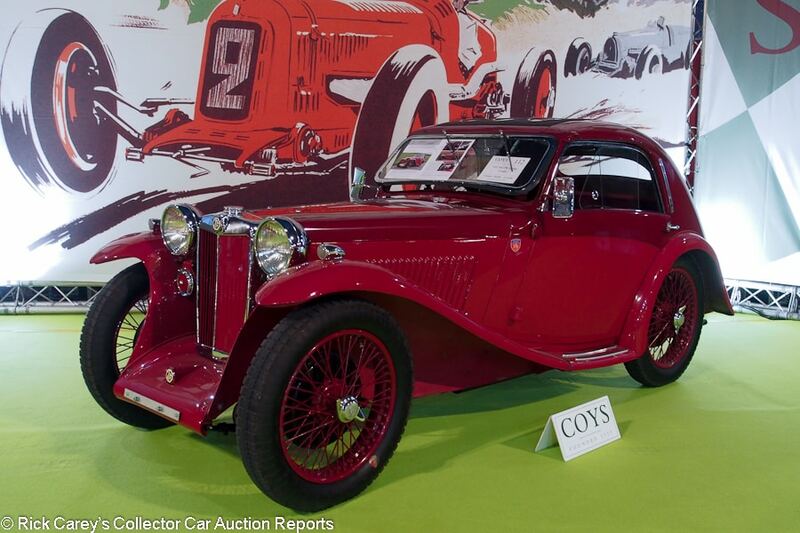 Lot # 112 1935 MG PB Airline Coupe; S/N PB0610; Dark Red, Red/Dark Red leatherette; Estimate $107,559 – $131,461; Older restoration, 2- condition; No result published – RHD. Body color wire wheels, Blockley tires, sliding side windows, rear spare set into the body, sliding sunroof with three glass panels, Lucas headlights, C-pillar mounted trafficators, opening windshield. – Very good paint, chrome and interior. Sharp gauges. Engine and chassis are restored like new and very clean. A very good example. 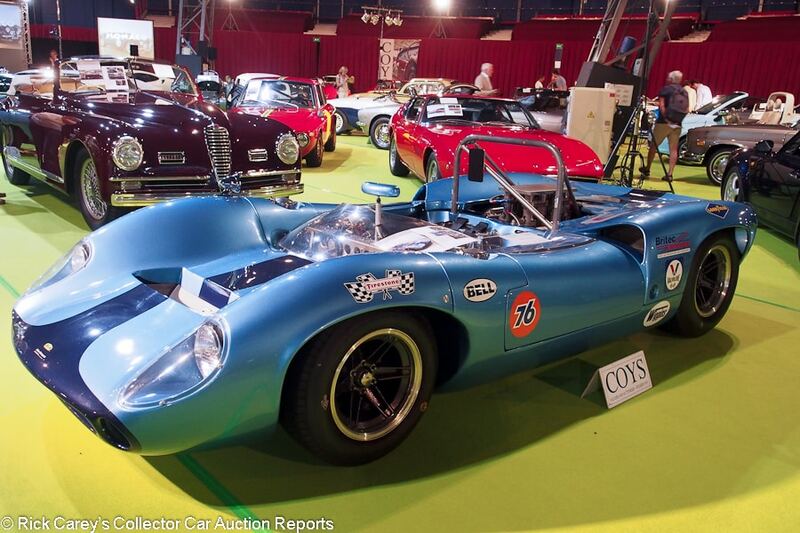 Lot # 125 1966 Lola T70 Mk 2 Sports Racer; S/N SL7145; Metallic Blue, Dark Blue stripe/Black vinyl, duct tape; Estimate $418,285 – $466,089; Competition restoration, 2- condition; No result published – RHD. 350/450hp, Hewland LG600 5-speed, 6-lug alloy wheels, Dunlop tires, fire system, MacKay intake with four downdraft Webers, chrome headers, Hewland transaxle. – Clean and orderly, not fresh but professionally presented and prepared. A car that car be driven with confidence but without any described history. 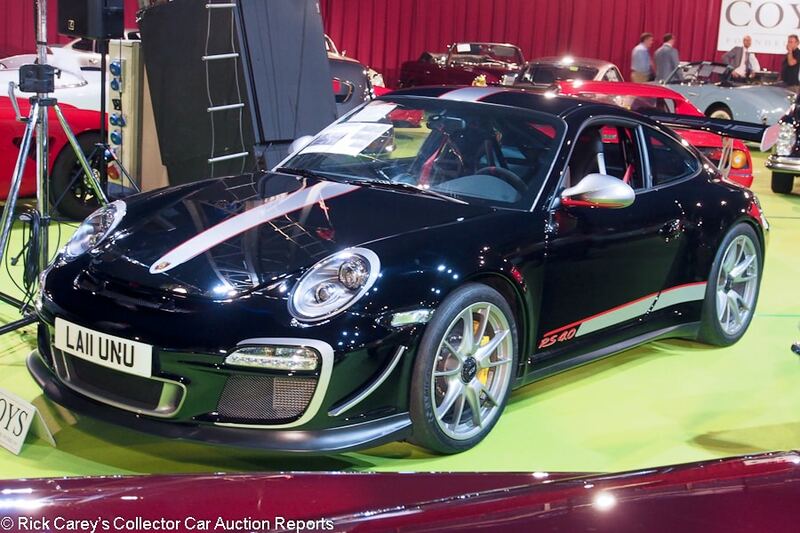 Lot # 128 2011 Porsche GT3 RS 4.0 997 Coupe; S/N WP0ZZZ99ZBS785161; Black, Silver stripe/Black leather, Alcantara inserts; Estimate $418,285 – $478,040; Unrestored original, 2- condition; No result published – 6-speed, Alcantara steering wheel, nav system, yellow calipers, carbon brakes, silver mirrors, accents and 19-inch centerlock alloy wheels. – Nearly like new with 6,000 km, serviced in December 2017. Lot # 133 1967 Lamborghini Miura P400 Coupe; S/N 3366; Orange, Silver sills/Black vinyl; Estimate $956,080 – $1,075,590; Recent restoration, 2 condition; No result published – Sanyo cassette stereo, power windows, centerlock alloy wheels, Michelin XWX tires, eyelashes, rear window slats. – Very good paint and interior, The underbody has been freshened. The engine is like new. 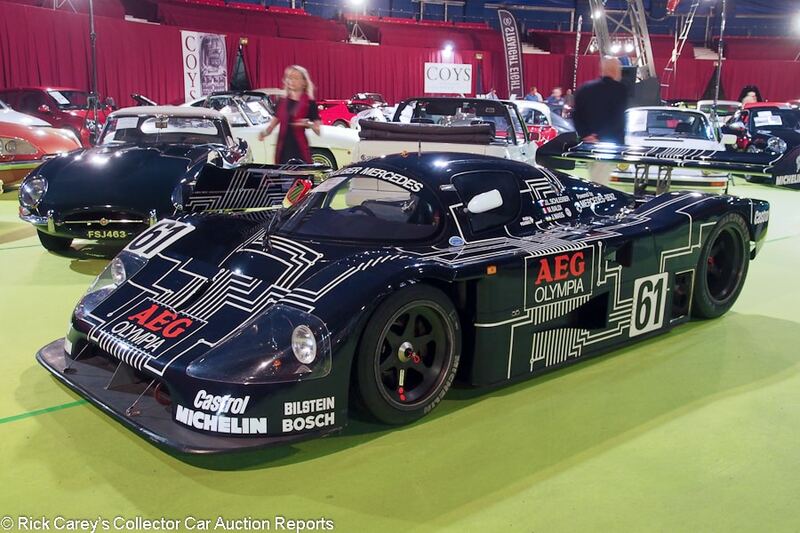 Lot # 139 1989 Sauber-Mercedes C9 Group C; S/N 89C9A2; Dark Blue, White AEG graphics/Black; Estimate $1,434,120 – $1,912,160; Competition restoration, 2 condition; No result published – Matte Black Speedline centerlock wheels, Michelin tires, Stack panel, fire system. – Decent cosmetics, very orderly, sharp and fresh chassis, engine and underbody. Clean sharp professional preparation and presentation. Represented as retained by Sauber until it was purchased in 2010 by the consignor. 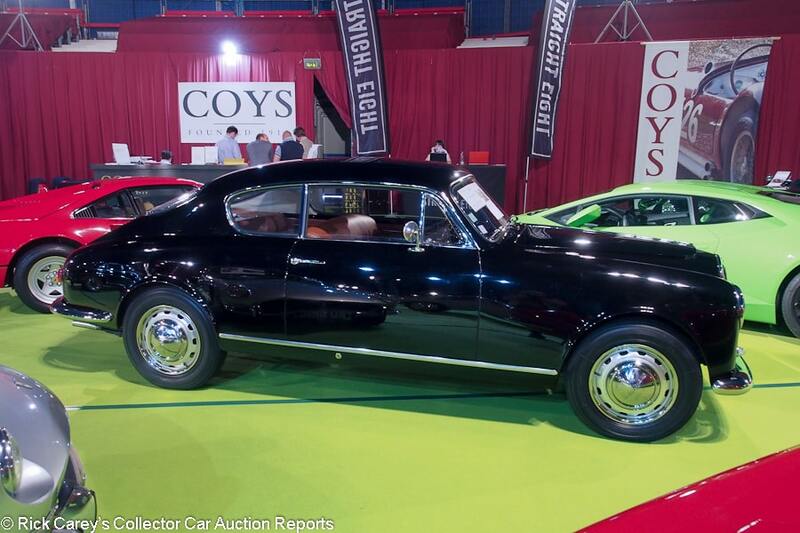 – This car, s/n 89C9A2, is listed in the results from Coys Fontwell House auction 9/7/2017 (the most recent auction with posted results on Coys website) as being sold for GBP 1,687,500. 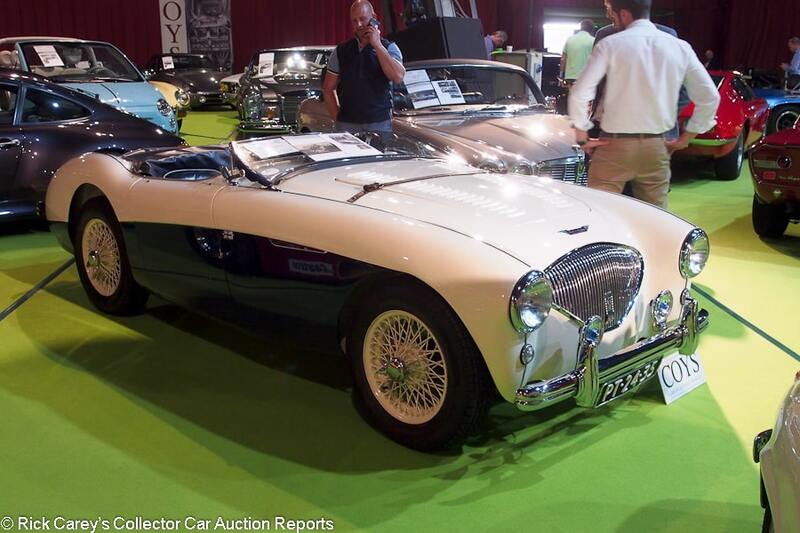 Lot # 142 1956 Austin-Healey 100/M Roadster; S/N BN1L150648; Ivory, Blue/Dark Blue leather; Estimate $143,412 – $179,265; Older restoration, 2- condition; No result published – Ivory wire wheels, Pirelli P3 tires, woodrim steering wheel, louvered hood, overdrive 3-speed, driving light and fog light, Lucas Le Mans headlights. – Very good paint but erratic chrome. Good lightly stretched and creased upholstery. Dead bug in the speedometer. Clean, orderly underbody with some miles. 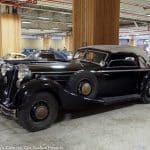 Lot # 150 1957 Lancia Aurelia B20S Coupe; S/N B20S1651; Black/Brown leather, Beige cloth; Estimate $167,314 – $203,167; Cosmetic restoration, 3+ condition; No result published – Floor shift, woodrim steering wheel, silver painted wheels, hubcaps, Michelin X tires, Carello headlights. – Scuffed paint and chrome. Good interior. Orderly underbody. The engine compartment is tidy but showing age and use. A decent cosmetic restoration. 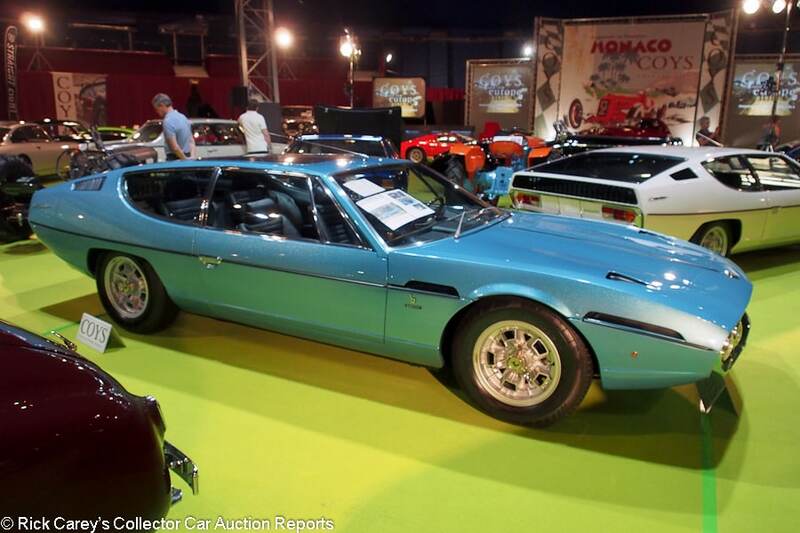 Lot # 162 1969 Lamborghini Espada Coupe, Body by Bertone; S/N 7293; Smalto Sky Blue/Dark Blue; Estimate $657,305 – $896,325; Recent restoration, 2- condition; No result published – Glass roof, Campagnolo alloy centerlock alloy wheels, Michelin MXV4 tires. – Dott. Fabio Lamborghini Collection. Good repaint and original interior. 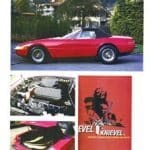 The engine and underbody are done to very good European standards. The chrome is scuffed but bright. 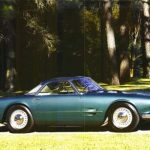 – Sold by Gooding & Company at Pebble Beach in 2013 for $214,500 where it was an unrestored original car in rather tired condition. 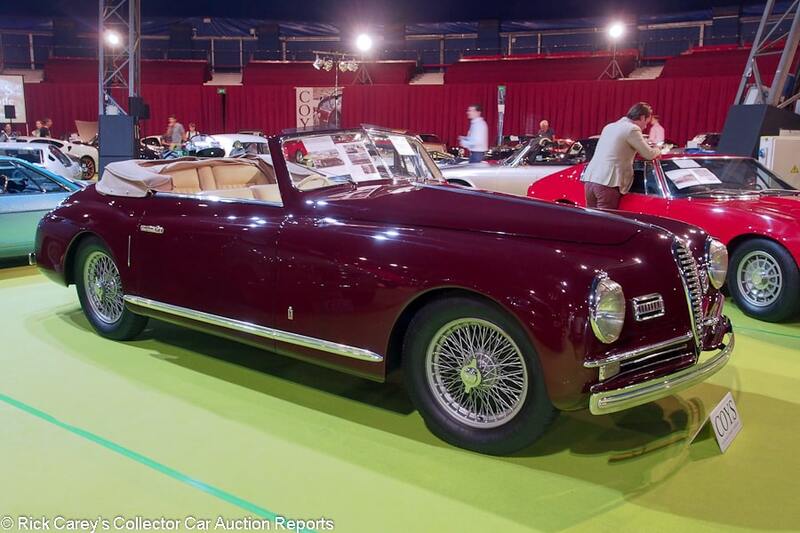 Lot # 165 1948 Alfa Romeo 6C 2500 S Cabriolet, Body by Pinin Farina; S/N 916009; Dark Red/Beige leather; Beige cloth top; Estimate $298,775 – $346,579; Older restoration, 3- condition; No result published – RHD. Silver painted wire wheels, Michelin tires, column shift, radio, banjo spoke steering wheel, translucent sun visors. – Bought new as a gift for a mistress, Emilia Sierra. Sound recent repaint over old paint. Sound older upholstery, lightly soiled and surface creased. Orderly old underbody and erratic chrome. An older restoration with more recent paint. – Sold by RM in London in October 2012 for $297,731, then in Paris in 2017 for $239,859. It has added 69 km to its odometer since last February. Lot # 167 1970 Maserati Ghibli SS Coupe; S/N AM115491780; Red/Black leather; Estimate $346,579 – $394,383; Cosmetic restoration, 3+ condition; No result published – Alloy wheels, Michelin XWX tires, power windows, Blaupunkt multiband radio. – Wiper scuffed windshield, good upholstery and dash top. Sound but scuffed older paint with some spots. Decent chrome. Old undercoat in the wheel wells. A sound and presentable driver represented as matching numbers. 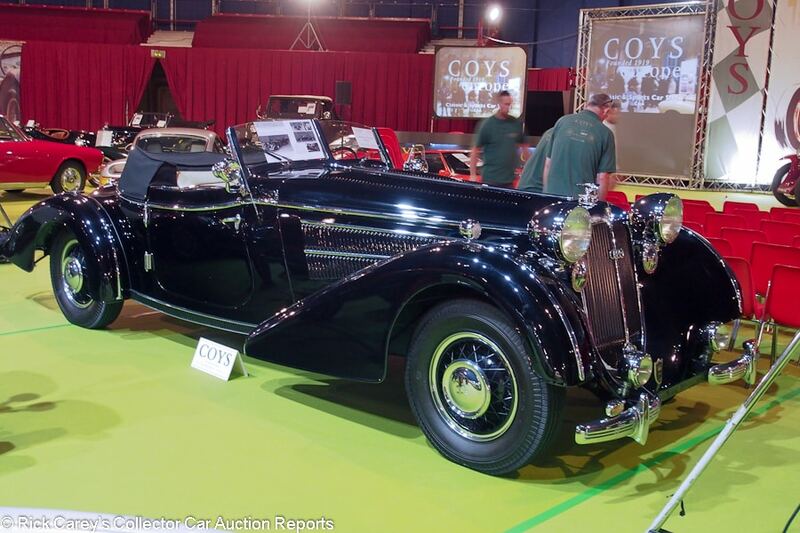 Lot # 177 1940 Horch 853A Sportcabriolet; S/N 854402; Black/Cream leather, Dark Blue piping; Black cloth top; Estimate $956,080 – $1,075,590; Rebodied or re-created, 3+ condition; No result published – Teardrop fenders, enclosed rear spare in the deck lid, vee windshield, dual spotlight mirrors, fog lights, Horch headlight lenses, trafficators in the windshield posts, 4-speed with overdrive. – Rebodied on a chassis reportedly found in Russia around 1990. Body includes attributes of both Erdmann & Rossi and Glaser designs. Very good older paint, interior and top. Thin chrome. Clean underbody and engine that is nearly like new. Very good dashboard wood and instruments. – Offered by RM in Paris in 2014 where it was reported bid to $777,343 and it now has 57 km more showing on its odometer than it did fourteen years ago. 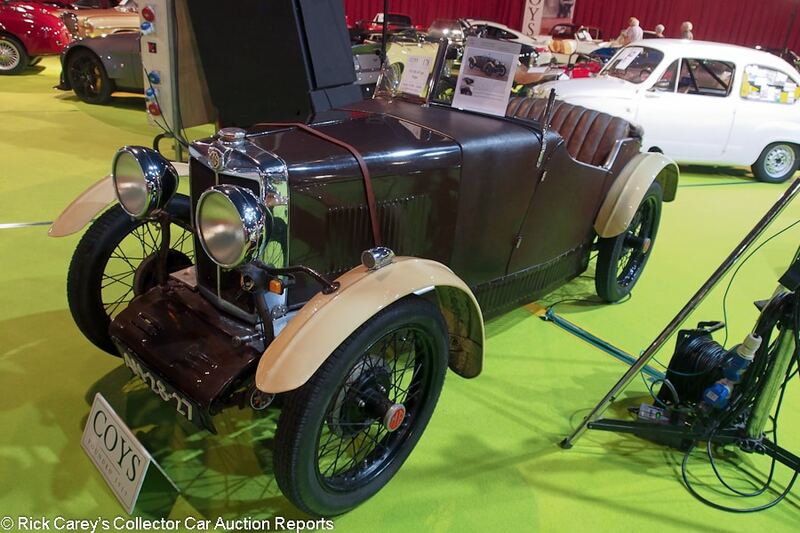 Lot # 178 1931 MG M-Type Midget 2-seater; S/N 2M2643; Brown leatherette, Metal, Beige fenders/Brown leatherette; Estimate $26,292 – $31,073; Visually maintained, largely original, 4+ condition; No result published – RHD. Vee windshield, cycle fenders, boattail body, black wire wheels) Lucas headlights. – Sound old paint with a big chip at the front and back of the hood hinge. Dull aluminum trim. Aged chassis, chipped and dirty. Sound upholstery, dirty old tonneau cover. Usable, but really needs a lot. 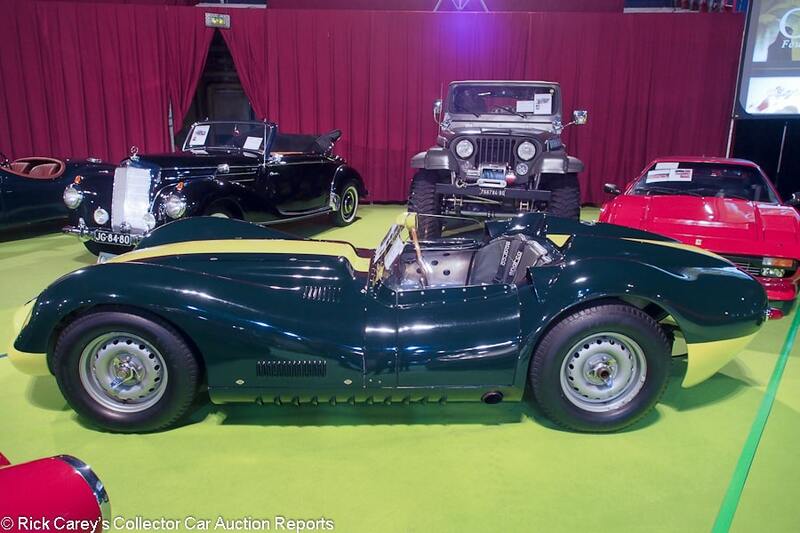 Lot # 180 1959 Lister-Jaguar Replica Knobbly Sports Racer; S/N OTL201; Dark Green, Yellow stripe/Moss Green leather; Estimate $448,163 – $507,918; Rebodied or re-created, 3+ condition; No result published – RHD. Dunlop style centerlock alloy wheels, Dunlop, Racing tires, full width Plexiglas windshield, woodrim steering wheel, covered headlights, Sparco 4-point belts. – Scuffed old paint with various minor chips and scratches. Good upholstery. The underbody is dusty. 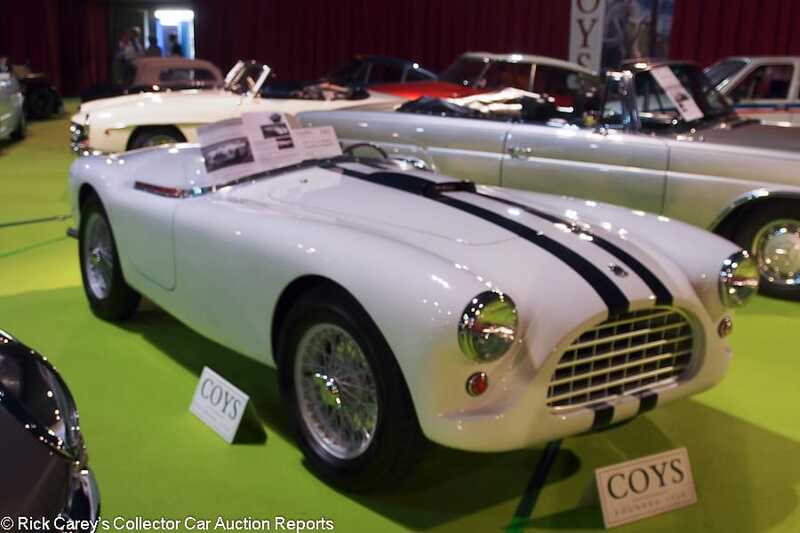 Lot # 183 1957 AC Ace Bristol Roadster; S/N BEX249; Engine # 100C687; White, Dark Blue stripes/Dark Blue vinyl; Competition restoration, 2+ condition; No result published – Metal passenger’s seat tonneau cover, wraparound Plexiglas windscreen, woodrim steering wheel, Grey painted wire wheels, Michelin X tires, driver’s head fairing. – Freshly restored like new with much better paint. Sharp, fresh chassis. Reportedly raced when new in the U.S. and then in Germany by Major James K. Cockrell winning a 1958 regional championship, then crashing in the 1959 1000 km at Nürburgring. Restored many years later. 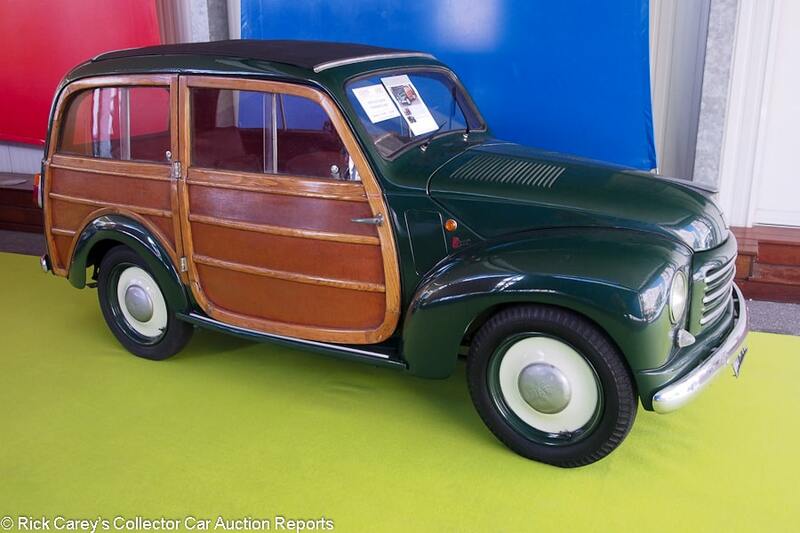 Lot # 193 1950 FIAT Topolino Giardinetto Woody; S/N 189685; Dark Green, Wood/Brown wood; Black vinyl top; Estimate $19,122 – $23,902; Unrestored original, 4- condition; No result published – RHD. Two-row seating, folding sunroof. – Composite body panels with wood framing, Torn upholstery, Dull old repaint over older paint. Cracked old tires. Old, tired, and neglected. Dry, cracked wood framing with wormholes and cracked, waterstained joints. A restoration project. 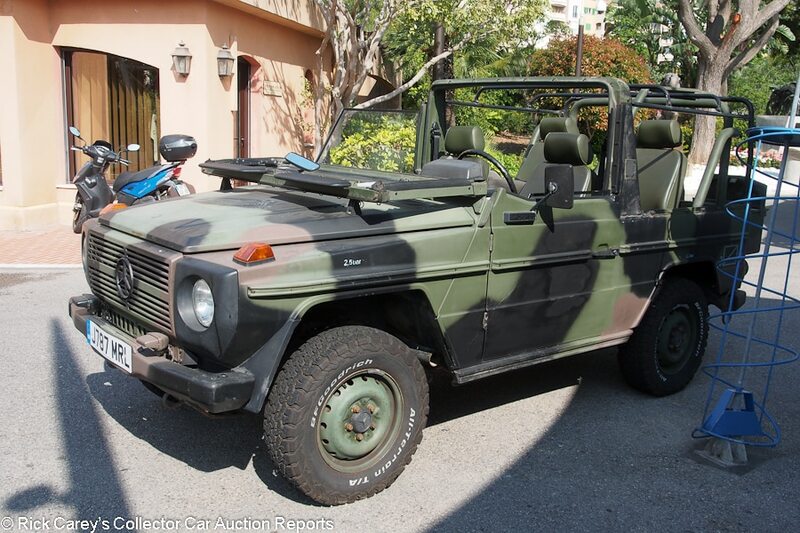 Lot # 196 1992 Mercedes-Benz 250GD Utility 4×4; S/N; Green camouflage/Olive vinyl; Olive vinyl top; Estimate $11,951 – $15,536; Unrestored original, 4 condition; No result published – Folding windshield, – Dull, dirty, used up. Largely sound, newer upholstery. A restoration project. – Somewhat ironically, the catalog (which calls this a 280GE) claims 17,000 km from new. The odometer reads 18,016 and has been around at least once, probably twice, based upon the condition. 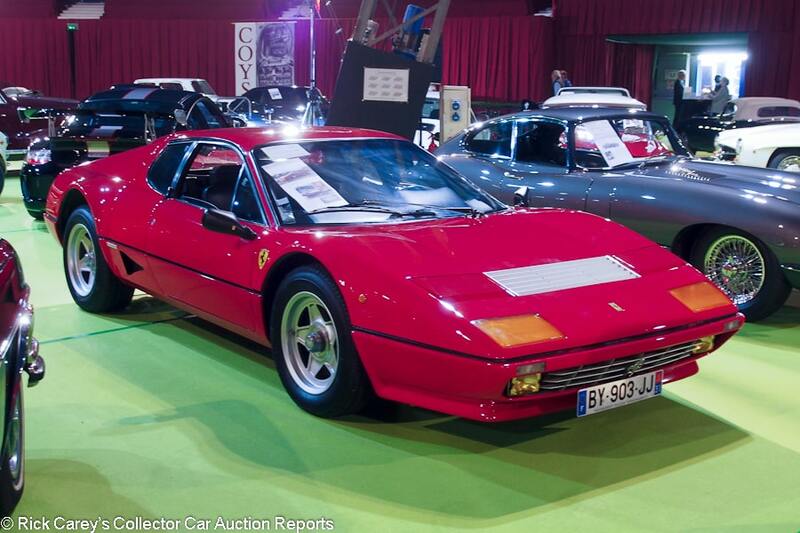 Lot # 197 1983 Ferrari 512 BBi Berlinetta, Body by Pininfarina; S/N ZFFSA09B000044995; Red/Black leather; Estimate $274,873 – $334,628; Visually maintained, largely original, 3 condition; No result published – Centerlock alloy wheels, Michelin TRX tires, Borletti air conditioning, power windows, SF shields, empty hole where the radio should be. – Surface cracked, stretched and worn original upholstery, dull window surrounds. Dirty original underbody and chassis. Decent repaint. Scuffed wheels. 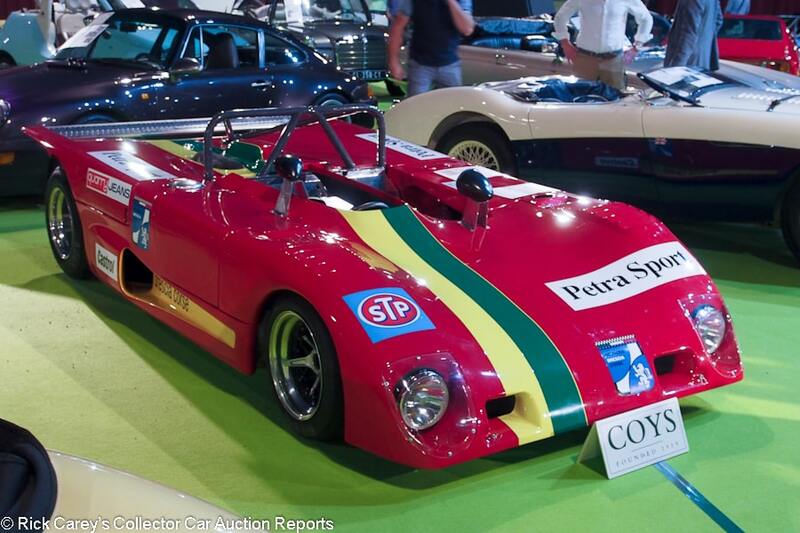 Lot # 198 1972 Lola T290 Sports Racer; S/N HU12; Red, Green, Yellow stripes/Black; Estimate $215,118 – $262,922; Competition restoration, 2- condition; No result published – Cosworth-Ford BDG 2-liter/260hp, Hewland transaxle, full width roll bar, centerlock modular wheels with polished rims, Avon tires. – Claimed to be 4th overall and class winner at the Targa Florio in 1972 driven by Antonio Zadra. Mediocre paint with fisheyes, especially in the stripes. The engine and chassis are very neat and professionally prepared. 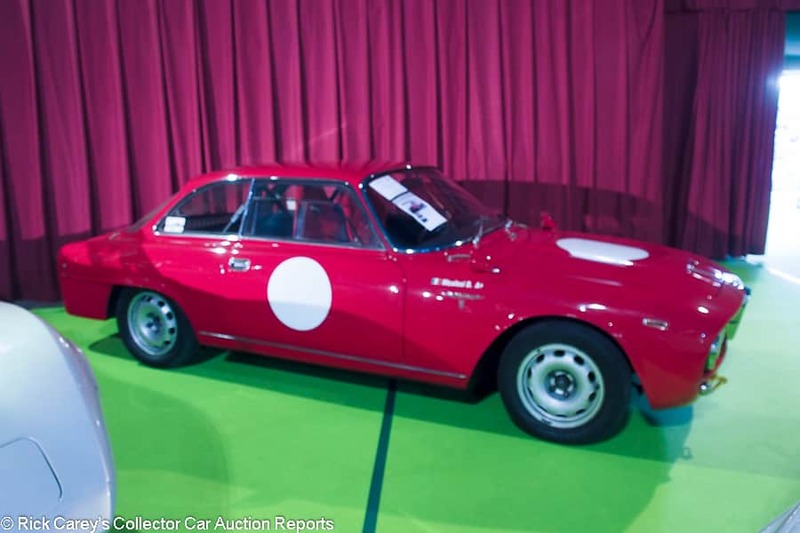 Lot # 201 1965 Alfa Romeo 2600 Coupe Competition; S/N AR826029; Red/Red cloth; Modified restoration, 3- condition; No Reserve; No result published – Technomagnesio alloy wheels, Dayton tires, bolt in rollbar, Sabelt racing seats, Veglia tach, no bumpers, 3 Weber 50DCO carbs, sliding Plexiglas side windows. – Poor, cracked, edge chipped old repaint. Scratched, discolored Plexiglas rear window. 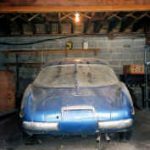 Aged, unrestored underbody, – The catalog calls this a “GTA”, which it most emphatically is not. It is an event prepared 2600 that claims participation in a number of Italian events.